This workbook started out merely as an aid to be used in documenting one of the features of the Zplots application. It then just kind of grew to have a life of its own so I decided to make it available separately. 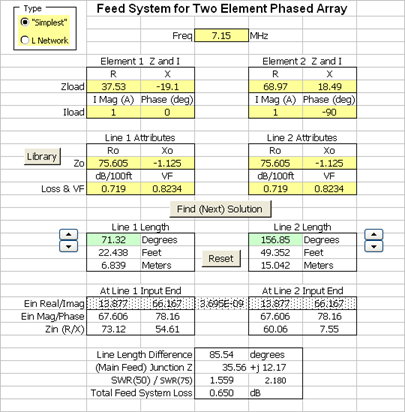 Using Feed2EL you can calculate the line lengths for a Lewallen "Simplest" feed system (also known as a "Christman" feed system). 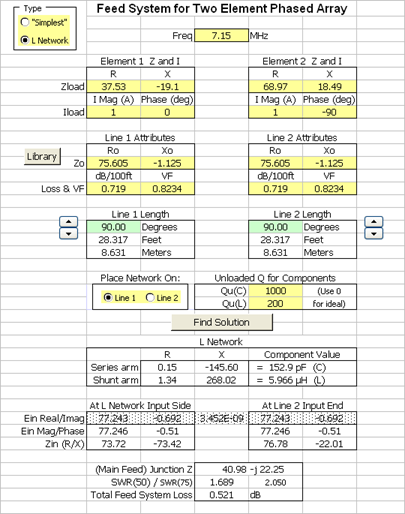 Or you can calculate the component values for an "L Network" feed system. A very detailed example may be found at the Zplots appendix page Seeing the Effects of Phasing Lines and won't be repeated here. However, that example glosses over how you should determine the attributes of the feedlines. If you want to use an estimate for the line attributes the easiest way to get the values is via the built-in library of line types. Be sure you have set the design frequency, then click the appropriate "Library" button and choose the desired line type from the dropdown list. The values shown will be automatically transferred to the correct worksheet cells. 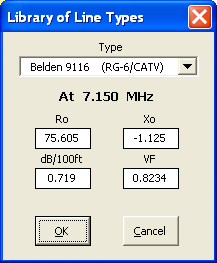 On the other hand, if you have an AIM or VNA device you may wish to measure a sample of your feedline to get more precise attributes. In that case please see the "Measure Transmission Line Parameters" Feature section of the Zplots documentation. If your sample is longer than a quarter wavelength at the highest measurement frequency you are likely to see something like the green trace at left for Zo (or Ro or Xo). You can avoid this problem by measuring a shorter sample, reducing the maximum frequency, or using the Zplots "Generate Data" for Transmission Line Parameters Feature to produce a "smoothed" curve like the red trace. Once you have finished the design of the feed system for the array you may wish to also design some form of impedance matching to the main feedline. 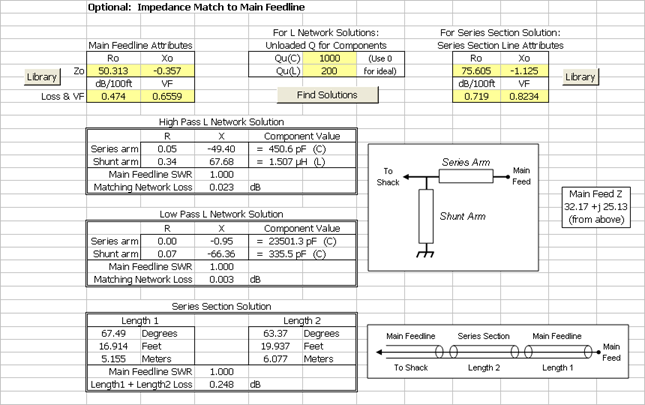 The bottom portion of the Feed2EL sheet shows the parameters for high pass and low pass impedance matching L networks as well as for a series section transmission line impedance transformer. As with the design for the array feed system, component losses and transmission line losses are taken into account when doing the calculations. Download Feed2EL.xls. Free. Requires Excel 97 or later. Feed2EL does not work with other spreadsheet software such as Open Office Calc, Quattro Pro, Microsoft Works, or versions of Excel earlier than Excel 97. None of these other spreadsheet programs fully support the macros used by Feed2EL. Download Sample Feed2EL Models.zip for several EZNEC (.ez) format models which demonstrate the feed systems described above.